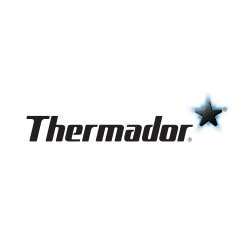 Unfortunately, Thermador appliances are no longer available in the UK and we cannot supply or service them. The nearest manufacturer in the UK market is Wolf. An old and trusted name, Thermador has been making fantastic kitchen appliances for over seven decades. Thermador’s creations have a style all their own, yet they rise to meet the standards of even the most discerning chief when it comes to efficiency and reliability. Thermador brings cooking to a whole new level with their novel innovations. In 1947, it was them who created the first wall oven! They are’t stuck in the past though. In 2012 they also created the first, full-surface cook top. Even now, they create luxurious stainless steel home appliances that are at home in any kitchen. Founded in 1916 by William E. Cranston, Thermador began as a manufacturer of electric items. They were most recognised at the time by their portable and built-in heaters. The company established its appliance manufacturing as Cranston merged with business owner H.H. Fogwell In 1932. This formed the Thermador Electric Manufacturing Company. Now part of BSH Home Appliances Corporation, Thermador is a fully-owned subsidiary of the third largest appliance manufacturer in the world, Bosch and Siemens Home Appliance Group. With a history that long, you can be sure that Thermador is a name you can trust. They also have great customer service to help you if you have questions and make the process as quick and easy as possible. Thermador has created a lot of fantastic products, include cookware. They have lovely, yet efficient ovens, ranges, microwaves, warming drawers, kitchen ventilation, and even build-in coffee Machines to offer. They also have cook tops. In fact, the range of cook tops have the patented Star® Burner and their speed cooking oven reduces cooking time by 50 percent! The company sell various refrigerator units as well. These include fridge columns, freezer columns, bottom freezer refrigerators, wine refrigerators, and the side-by-side refrigerator/Freezer units. Rounding out their kitchen appliance selection is their selection of top of the line dishwashers. In short, the whole line of appliances are intelligently designed, easy to clean, beautifully stylish, and most importantly, efficient and reliable. When it’s time for you to get new kitchen appliances, they have everything you need to build the kitchen of your dreams.